3. Vessel, Pakistan (Baluchistan), Indus civilization Mehrgarh style ca. 3000-2500 B.E. 4. Seated Mother Goddess, Pakistan (Baluchistan), Indus civilization Mehrgarh style ca. 3000-2500 B.E. On a recent trip to New York, I was able to get away for an afternoon to explore the ancient Indus collection at that battleship of a museum, the Metropolitan Museum of Art. I found the Indus collection split between two rooms, 234 in the Asian Art and 403 in the Ancient Near Eastern Art sections, with a nice long walk in between. I had not been for about ten years to see the Indus pieces. I was delighted to find very recent contributions from private collections, as well as unusual and thought provoking items from the US-financed excavations at the manufacturing center of Chanhu daro in the 1930s. There are some beautiful pieces. 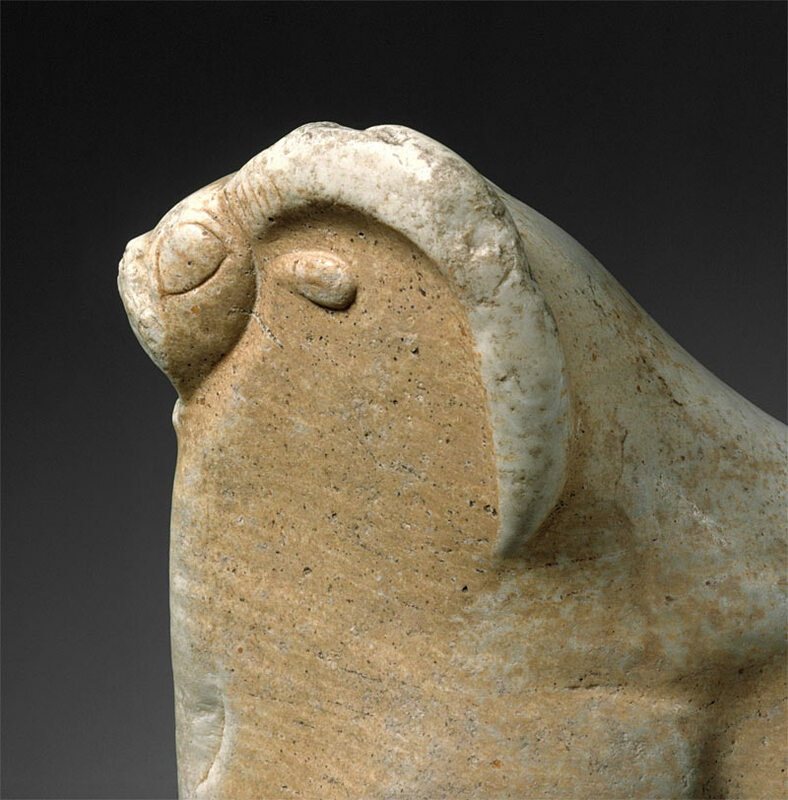 There is a magnificent "Reclining mouflon (wild sheep), [image 1]" in marble - "numerous images of this type of various sizes and materials come from Indus Valley sites." 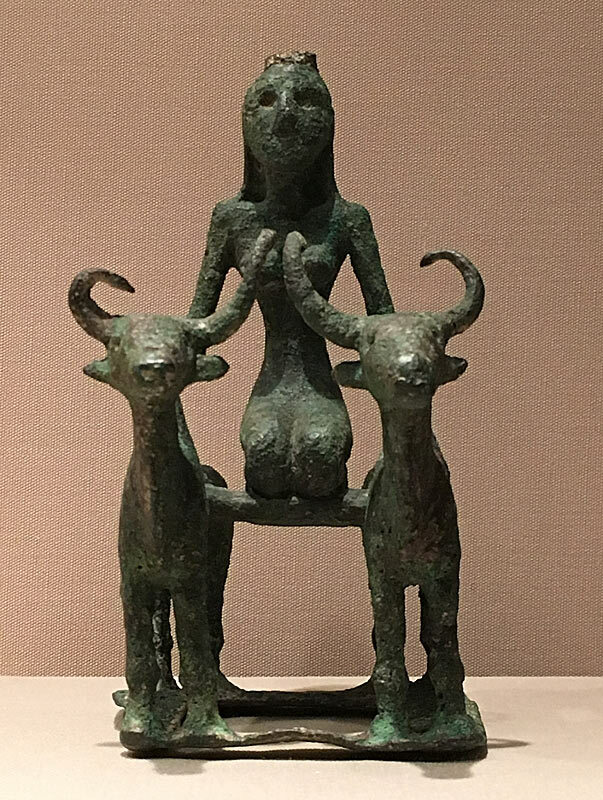 There is the oldest Indian bronze, "Woman Riding Two Brahman Bulls, " from Uttar Pradesh and dated to the late Harappan period, "a rare survivor of the early bronze culture shares across northern India and the Indus Valley (Pakistan) in the second millennium B.C. Two humped ('Brahman') bulls support a platform on which a woman is knelling; her figure-type is mirrored in standing females in clay from this period." A gift to the museum in 2015 by a private collector is yet another notation supporting an important role for women in Indus cultures. 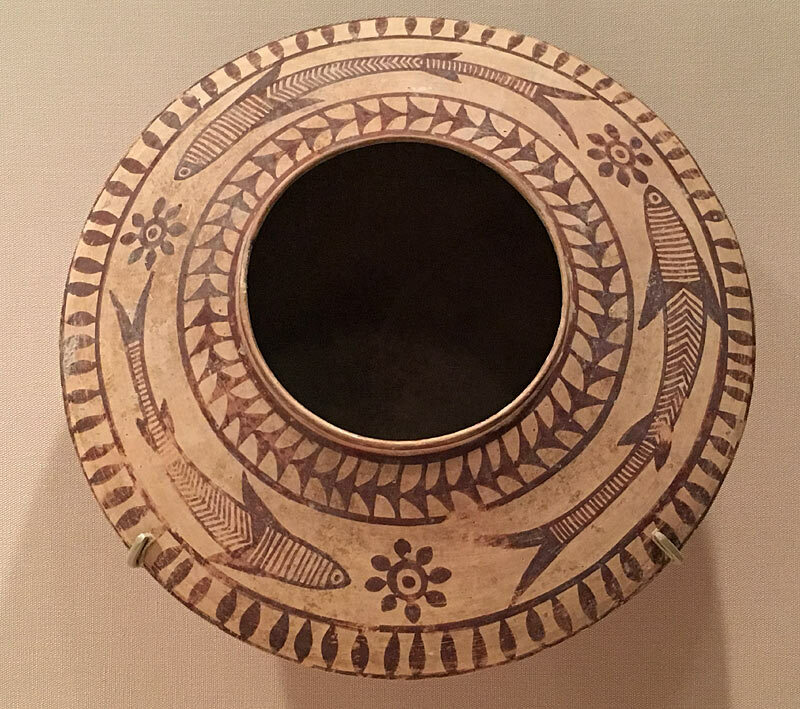 There is the amazing ceramic "Vessel"  in "Mehrgarh style," from 3000-2500 BCE, the fish ready to come off the bowl. 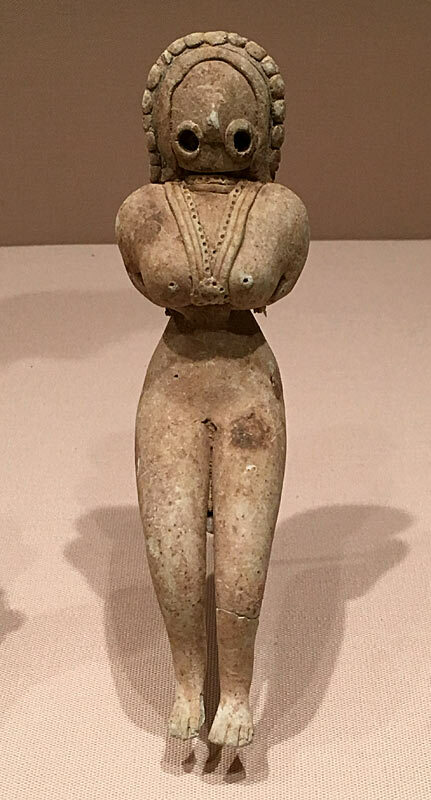 Another "Mehrgarh style" terracotta piece is the typically haunting female  figurine we see so often from Balochistan now, this too a recent purchase by the Museum. 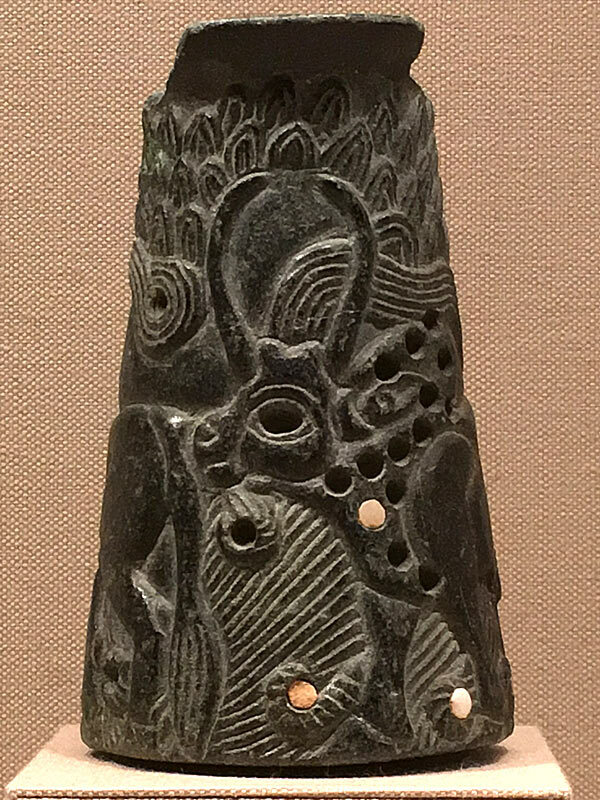 Is she a "Mother Goddess", as the Met has dubbed her, or did these figurines represent something different? I came to accept that the organization of Indus objects in two disparate displays was sloppy, but also spoke to the way the Indus civilization straddled active West Asian, Mesopotamian and western Iranian highland cultures (like the newly discovered Jiroft or Halil Rud civilization). We know that, as all large civilizations expand, its people go the borders and trade across larger networks. A wave of developments starting after 8,000 BCE seems to have come upon ancient tribes and cultures in the Indus plains and westward to Anatolia. People and industrial practices, things like seals for trade, raw materials like lapis lazuli, and words between people, describing new things flowed rapidly across geographical frontiers. As other recent objects at the Met show, things went east to west as well. An anonymous loan made possible display of this chlorite "Vessel with two zebu"  from southern Iran 2700-2350 BCE. "Zebu, a variety of cattle with large humps and long horns were native to the Indus Valley but were also represented on objects made in Mesopotamia, Iran, and the Gulf region, beginning in the third millennium B.C." From the same period is the splendid copper alloy "Plate with reclining zebu,"  once again reminding us of the fluid craftsmanship of these pieces 5000 years ago; the styles could be contemporary. The gift of this object to the museum was made in 2015. Our understanding of ancient Indus times is constantly shifting indeed, especially as pieces otherwise lost in private collections come to light. 4. Seated Female Figurine, Pakistan (Baluchistan), Indus civilization Mehrgarh style ca. 3000-2500 B.E. 5. Vessel with two zebu 2700-2350 B.C. 6. 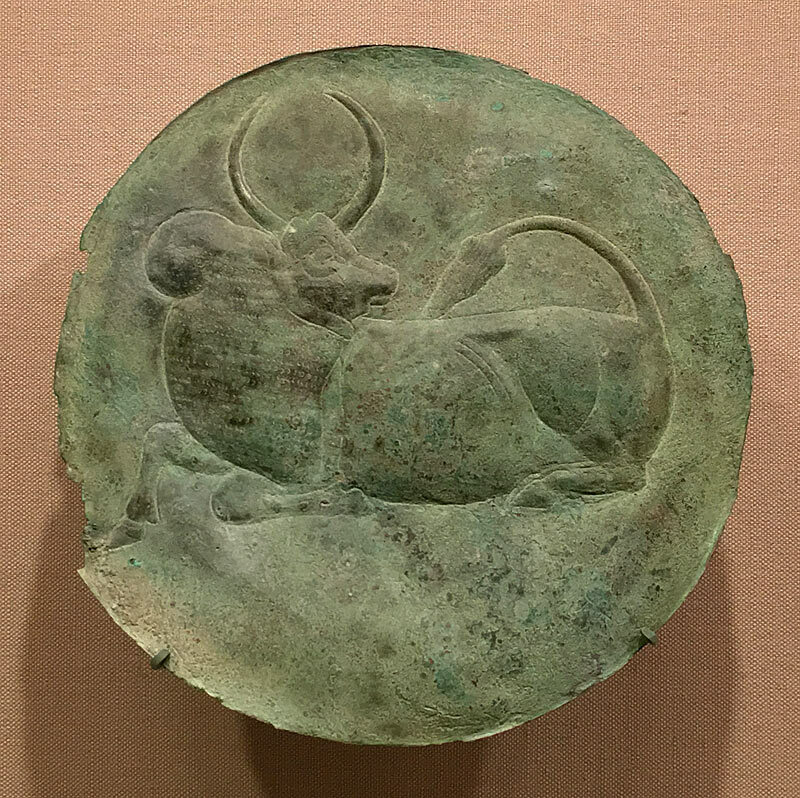 Plate with reclining zebu, Late 3rd-early 2nd millennium B.C.